If it’s summer where you are, I hope you also have plenty of excellent things planned for this last month before the ease into fall. Make that beach run! 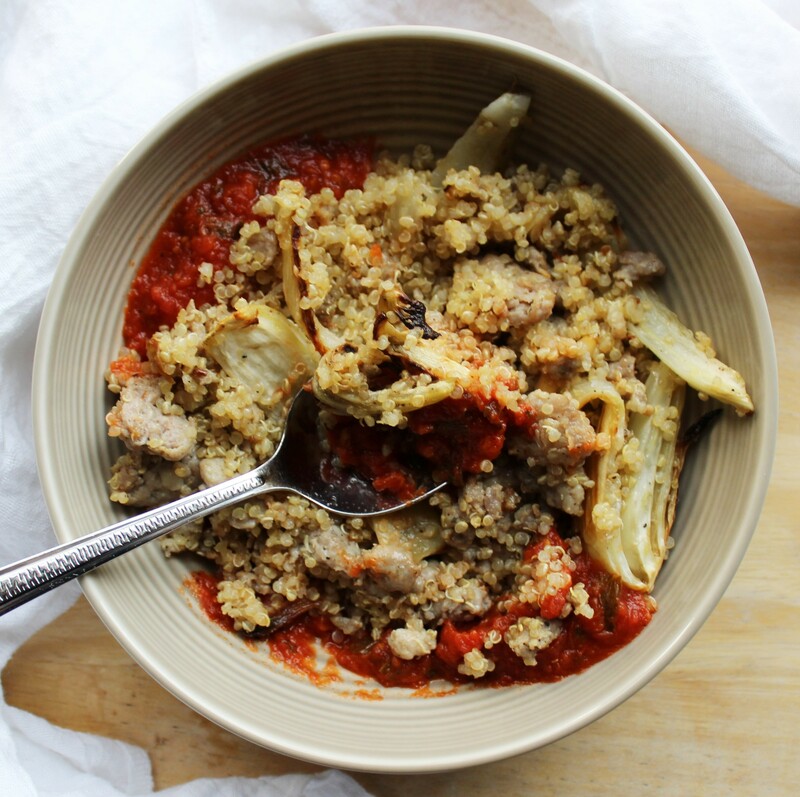 Even though these sausage and fennel quinoa bowls don’t exactly scream summer, they are still great to make at this time of year. They are quick and easy, and that’s what the best summer cooking is, right? Quick and effortless does it for me any day of the year, but especially now, when all I want to do is sit outside obsessively reading beachy thriller novels and enjoying the lovely long evenings while they last. And I’d argue that the slightly licorice-y tang of the roasted fennel does lend a freshness to the dish that reverberates with this season. Preheat oven to 425 degrees. Toss the fennel slices in one tablespoon of the grapeseed oil and the kosher salt. Spread evenly over a oven-safe baking pan and roast until tender and caramelized, about 35 to 45 minutes. While the fennel is roasting, rinse the quinoa and add with the two cups of water or vegetable stock to a medium-sized pot. Bring to a boil, then cover and reduce the heat to medium-low and let simmer for 15 minutes, or until all of the water has been absorbed. Add the remaining two teaspoons of grapeseed oil to a large frying pan over medium heat. After removing it from its casing and breaking it up into smaller, roughly uniform pieces, add the sausage to the pan. Stirring frequently to ensure even cooking, saute it until it’s browned and no pink remains, about seven to eight minutes. Mix in the pinenuts and minced garlic and saute an additional one to two minutes. 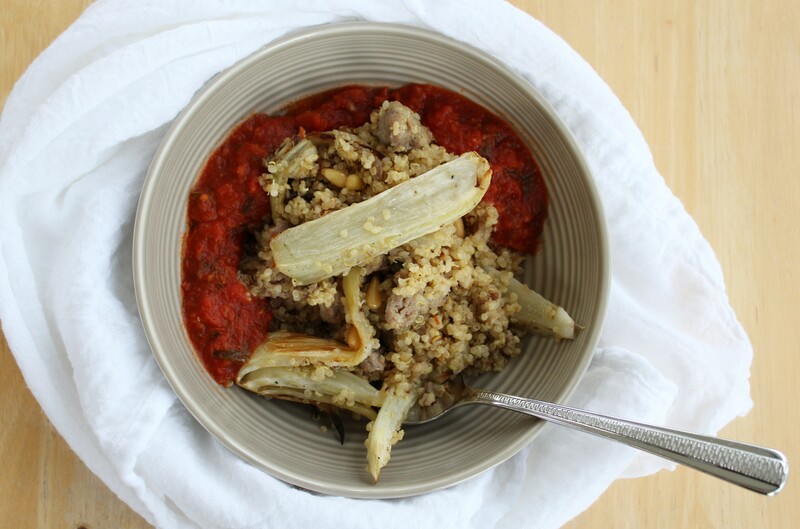 Once all of the components of the dish are done cooking, layer serving bowls with the quinoa, sausage/pinenut/garlic mixture, and the roasted fennel. Pour marinara on the side of each serving, and you’re done! Makes about four servings. Looks very easy and healthy..can’t wait to try!